Three German commercials for Majora’s Mask 3D have surfaced today. They are cool to watch even if you don’t happen to live in Germany. The game’s launch is quickly approaching now, so it’s time to be getting hyped for this great game! 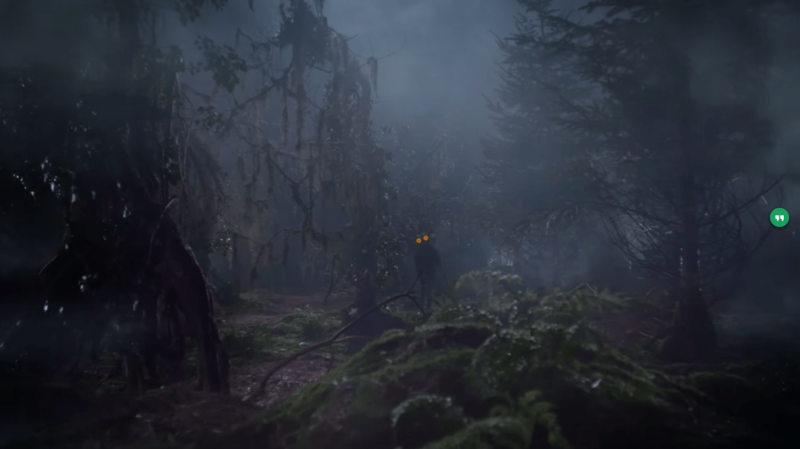 Running into Skullkid wearing Majora’s Mask at night in the swamp, as pictured above from one of the commercials would be pretty scary. He just stands there and makes that creepy laugh and stares at you with those creepy, glowing Majora’s Mask eyes! The first of the three commercials for Majora’s Mask 3D has some impressive visuals and a very spooky vibe that is quite fitting of the game. Majora’s Mask is easily the darkest and spookiest entry in the Zelda series, after all. After the spooky intro, the commercial switches to a more cheery vibe with the appearance of our hero, Link. At the end of the commercial, it shows the limited edition Majora’s Mask 3D box. The second commercial shows a number of short clips of gameplay footage from Majora’s Mask 3D. The visuals, of course, look much better than the Nintendo 64 original. During the various clips of in-game footage, this commercial plays some sinister music from the game itself. We see clips of Link and Epona, Skullkid, the Bomber’s Secret Society of Justice, a path in the mountain area, a dungeon, and a number of other things, such as one of the Great Fairies (who I’ve also heard referred to as the Great Boobie Fairies). The third and final commercial of the trio is another montage of game play footage. In the background, you hear the frantic music that plays in the Mayor’s office when he is caught in a tough spot between two groups of citizens (those who want to evacuate and those who want to have the festival in spite of the approaching moon). We see clips including the swamp area, Woodfall Temple, Snowhead Temple, Skullkid, Link, and the moon falling upon the poor souls still in Clock Town. The Legend of Zelda: Majora’s Mask 3D is set for release on February 13.